Ras Abu Galum is one of the few dive sites that is reachable by one or two day camel safaris from Nesima. It is located to the north of Dahab and lies in a mountainous and rocky area, where a camel ride is spectacular, although touristy. It is possible to stay the night near Bedouins and enjoy the stars in the desert. Diving is often started with a sandy slope that descents the further we enter the ocean. A plateau emerges with drop-offs at all sides especially at its southern side. You will see pinnacles and beautiful rock formations with trevallies in the blue. The northern side and a dive site locally known as the Alternatives are more famous for its coral gardens. There are emperorfish, crocodile fish, turtles and pufferfish near the reef and different types of coral such as fire, brain, table and soft corals as decorations. Technical divers will love this area as well because of its moonlike landscape at depths. One of the most special encounters you can have here is one with a manatee or better known as a sea cow. Ras Abu Galum national park is one of the parks with a steady population of these herbivores. It is a mammal the size of a seal but with a very special snout. You still have to be cautious as they can have a body mass up to 1000 kilogram's and can knock you out by just touching you. It is definitely going to be some experience diving with mammals as there are not many places in the world where you can. Aqua Sport, the first diving centre in the Middle East and has developed into one of the world's leading diving organisations. Aqua Sport has grown to encompass 3 diving facilities, each equipped with modern diving and watersports equipment & superb edcational infrastructure.Aqua Sport is the 5th PADI training facility in the world.Aqua Sport's purpose built daily and liveaboard dive boats operating to carefully selected locations provide access to some of the Red Sea's most isolated and untouched diving sites.With the calm waters of the Red Sea on our doorstep making training pools unnecessary, Aqua Sport is truely the underwater classroom of the world. n this site we would like to give you an impression of the Sinai & the high mountain region around St. Katherine and the amazing variation it offers. AWAY AWAY also offers its services to make your stay in the Sinai and St. Katherine the way you would want it to be, and if possible even better. Awayaway-sinai gives a large amount of background information about the Sinai: the historical, geological and natural history are covered. Also the many interesting sites in the Sinai are reviewed. Away Away focusses for a large part on the central high mountain area around St. Katherine, also providing services for the beautiful el Karm Ecolodge. Away Away also organises treks,( hiking, cameltreks and jeepsafari's) in the central and western parts of the Sinai. Ras Abu Galum is undoubtedly one of the Red Sea's best and most untouched dive sites. It lays in the Abu Galum National Protectorate and is accessible either by camel from Dahab, or by 4WD Jeep ride from Nuweiba. 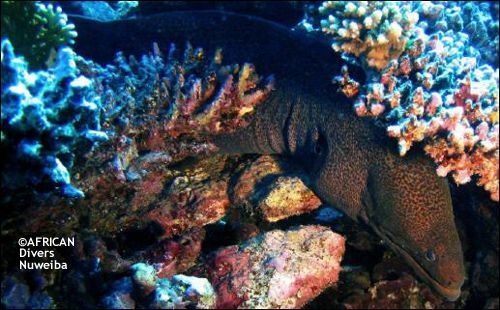 Exclusively, African Divers Nuweiba offers 2 or 3 day dive safaris to this National Park area, an unforgettable experience.